Tom Holt is one of my favourite authors. He usually writes charming stories about our world with a splash (or a bucketful) of magic thrown in. So it was with a little trepidation that I approached his first foray into science fiction. After all, what works in one type of story doesn’t necessarily translate into another. I needn’t have worried. Blonde Bombshell is a cracker of a book, one I thoroughly enjoyed. In a galaxy far, far away is a planet known as ?????. It’s a peaceful place, run by beings of supreme intelligence. There’s only one problem: some infernal noise coming from a place called Dirt, which is preventing the citizens of ????? from doing their work. That noise must be stopped. And the best way to stop it is with a bomb. Problem is, the bomb is sentient, and it has its own ideas. First of all: what happened to its Mark One version? Secondly: who is Lucy Pavlov and why does she program in base 4? And finally: what’s with this smiling thing anyway? Thus unfolds a fast and dazzling tale as Lucy and the bomb try to save/blow up the world with the aid of a chap called George Stechkin, a unicorn, several octopuses in varying states of decay, and two very-definitely-not werewolves. I loved this book. It’s kooky, hilarious, and extremely well written. There’s even a little bit of thought-provoking stuff in there, which was rather unexpected. It’s great right up till page 225 or so – and then it’s bloody marvellous. I’m pretty sure I began cackling with glee somewhere around there, when Mr Holt unleashed the big guns and the ride became even more rollicking. I tried to think of some negatives, just for the sake of balance. I couldn’t find any. This is a real gem of a book – imagination run riot to create the most fun I’ve had reading in quite a long time. Find it, read it, love it. Make your friends read it. You won’t be sorry. 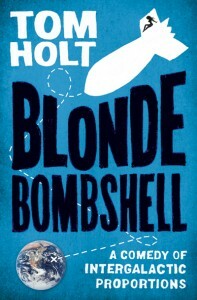 Blonde Bombshell is published by Orbit and will be released in the UK on 13 May and the USA on 18 June.